A kicked up version of an old classic! 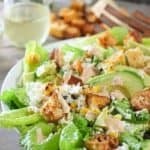 This salad uses store bought mayo with a few fresh ingredients but he croutons steal the show! Add chipotle, garlic powder, salt and pepper to melted butter. On large sheet pan, toss cubed ciabatta and melted butter mixture together. Bake for 10-12 minutes or until edges of croutons are nicely browned, turning once. Cool for 15 minutes before tossing with salad. Combine all dressing ingredients with a whisk. Arrange salad ingredients in large bowl. Top with croutons and dressing and serve!